Our team at Shorewood Family Dental Care is ready willing and able to help you with your dental emergencies. But if it was up to us, none of our patients would ever need emergency dental care. We know that’s not a realistic expectation, but we do hope that you will take steps to protect yourself and your family as much as you can. That certainly includes routine visits to our dentist office in Shorewood, IL, for dental cleanings and exams. But it should also include plans to get athletic mouthguards for all the athletes in your family from your youth league stars to weekend warriors. When you call 815-725-5991 or contact us online to schedule your next appointment, ask us about the benefits of athletic mouthguards, too. Quick question: which of the following sports/activities is the least likely to cause a dental injury? Think about it for a minute … got your answer? If you said football, then you are right. That will probably come as a surprise to many people. Football is, after all, a violent sport where hard contact is a part of the game. The thing that separates football from the rest of these sports is that its athletes are required to wear mouthguards in order to participate. We didn’t just pick those other sports on our list because they all start with B, either. We picked them because each one is mentioned by name in the American Academy of Pediatric Dentistry’s Policy on Prevention of Sports-related Orofacial Injuries. To be more specific, baseball and basketball were identified as the sports most likely to cause injuries among youth athletes. Baseball causes more dental injuries than any other sport among 7- to 12-year-olds. Basketball leads to the most dental injuries among 13- to 17-years olds. And what about bicycling? According to the AAPD report, the bicycle is the “consumer sports product” related to the most dental injuries in children. The AAPD also noted that other recreational activities such as skateboarding and roller blading pose a risk for dental injuries as well. Who Needs An Athletic Mouthguard? With the arrival of the fall sports season, football practices will be starting soon for Illinois high schools. We also know that football players won’t be allowed on the field without a mouthguard. For that reason, we want to call your attention to the fall’s other high-impact sports. Soccer, tennis, and volleyball teams also will be taking to the fields and courts again soon. 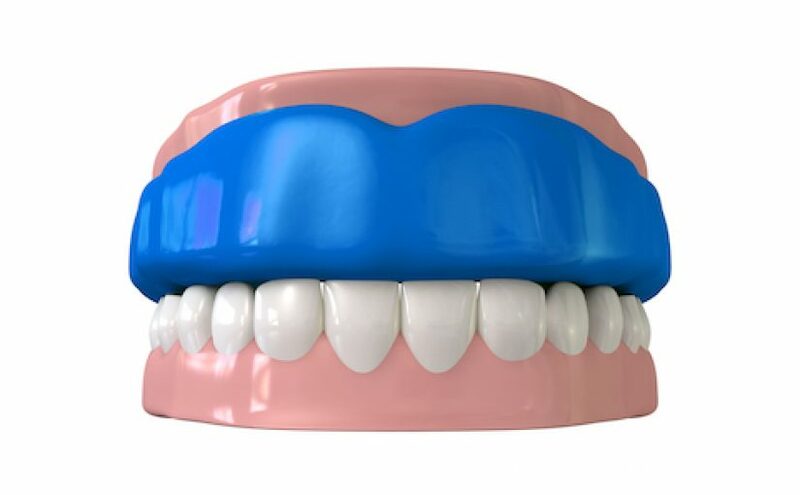 While mouthguards are not required for these sports, the AAPD, the American Dental Association, and the other professional dental organizations recommend wearing them for any sport that involves frequent running, changes in speed and direction, jumping, or flying equipment (balls, bats, sticks, etc.). A mouthguard isn’t going to stop an accident or collision from occurring. Then again, neither does a seatbelt, but we all understand the importance of wearing one while we are in a moving motor vehicle. An athletic mouthguard isn’t may not stop your son or daughter from falling or getting hit in the jaw with a ball or an elbow. Yet wearing a mouthguard might be the difference between a cracked, broken, or lost tooth and a sore lip. As an adult, you have probably accepted that you are not going to play professional sports. Even so, you may enjoy competing in recreational leagues or playing pickup games with family, friends, and coworkers. (If you are a pro athlete, you should wear a mouthguard, by the way). You don’t have to be a pro to twist your ankle, and you don’t have to be a pro to suffer a dental injury, either. Don’t let what you are doing for fun and to stay in shape lead to a dental emergency. Wearing an athletic mouthguard is the best way to protect your teeth on the court or field — win or lose — so you can keep smiling when the game is over. If you do suffer a dental injury, please keep our number (815-725-5991) handy so you can reach us as soon as possible to get emergency dental care. We also hope you will take our suggestion seriously about protecting your smile with a comfortable athletic mouthguard.